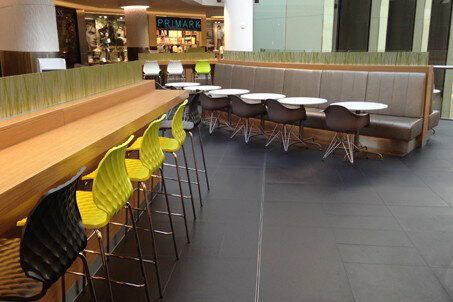 Redesign and refurbishment of the central food court in one of Britains largest shopping centres. Intu Lakeside shopping centre in Thurrock Essex is the 7th largest shopping centre in the country and as part of ongoing major investment in the centre, the food court area has undergone a major facelift. At Working Environments Furniture we were extremely pleased to have been part of this process, assisting in the specification and winning the contract to supply the loose furniture package. A process that lasted over a year and involved in-depth selection criteria and product testing, finally resulted in installation during May of this year. The space designed by RAWLS includes new furniture throughout in a number of canteen/ cafe and soft seating areas.